Soon it will become clear to men that signs they look for are appearing. For some these signs will seem inevitable and welcome. For others they will seem like the dissolution of all that they hold dear. In truth, they will be the signs that denote the new, and are but the outer expression of profound changes that are taking place. In time, most will agree that much was wrong in the old world, now quickly passing out, and had to be sacrificed for the better expression of man’s nature and accomplishments. Soon, therefore, the changes heralded by these signs will alert the keen-eyed of men that we are entering a new dispensation, one of which all can be proud. Q. 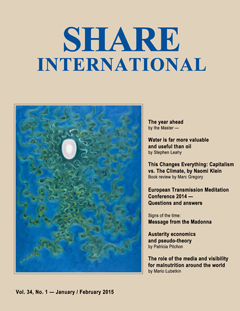 How many appearances has Maitreya given in China since this question was answered in the April issue of Share International? A. He has given four more interviews in China, totalling 19 in China (a total of 154 interviews to date). Q. Do some viewers who see Maitreya have an instant response of love towards Him? Q. (1) Are there many viewers who intuit that the person they see on their television screens is a great spiritual being? (2) Do some see Him as the long-awaited Teacher? Is this happening more and more now? A. (1) Yes. (2) Not necessarily. Q. Will Maitreya come to Spain for a television interview as He is doing in other countries? A. He will be seen and recognized throughout Europe and elsewhere. Q. In His article ‘Maitreya steps forward’ published in the Jan/Feb 2007 issue of Share International your Master says: “Maitreya will speak to millions of men through television and radio. All will have the opportunity to share in His blessing which will accompany every appearance.” (1) Is this Blessing given to the audience in each appearance of Maitreya on television? (2) Can we expect that around 50 per cent of the audience will experience a kind of ‘sanctity’ in His interviews? (3) Is inspiration and hope rising from the hearts of those watching His interviews? A. (1) Yes. (2) No, it cannot be quantified. (3) Sometimes. Q. My sense is that the work of the groups around the world (informing the public about Maitreya’s emergence and the work of Transmission Meditation) has just entered a new phase. It feels as if we are now called on to be ‘adult’ and ‘professional’, ‘more responsible’ and to be more willing to engage with the public. We have done this in the past, I know, but it’s as if everything is being stepped up a level – in intensity and in quality. Could you comment please? A. One would expect that to be the case. Q. The Master Jesus and Maitreya seem lately to be making far more use of a ‘spokesperson’ when giving people experiences. (1) Is this because the Master Jesus and Maitreya’s presence and energy is required elsewhere? Or is it to train the spokespeople and prepare them for their work in the near future? Or both? (2) Are spokespersons necessarily disciples? A. (1) Both. (2) At some level, yes. Q. Negotiations between Iran and six other countries to limit Iran’s nuclear program in exchange for lifting international sanctions were so difficult that they almost collapsed several times in the days before a preliminary agreement was reached on 2 April 2015. When last-minute difficulties were encountered, creative solutions to the roadblocks were somehow found under a very tight deadline, negotiators later said. Did Maitreya help negotiators, either directly or indirectly, to successfully conclude this agreement? Q. Will Easter become a major shared spiritual festival in future? Could it be that it will be a festival that can be shared by people from both the East and the West? Around 1991 when I was small, almost a child, I had a vision in the night sky at home in Fortaleza. My mother, aunt and I were watching TV when suddenly I heard a deep voice saying to me: “Come and see”. He repeated this three times. It was raining. When I opened the door and looked at the sky, I saw a man riding on a white horse, holding a sword. He reared his horse and raised his sword as if it were a greeting, or a victory. And then he rode away on the clouds. And the Knight, the sword and the horse were a gleaming white. I still do not understand what it means. I said to my mother and aunt: “Look! A white horse in the sky!” But they saw nothing. I insisted and insisted, but they saw nothing, just me. And then when I went out to the street to buy an ice cream, I looked up at the cloudy sky and saw a hole in the sky, illuminated in white. I do not know if the Knight was against me, or was in my favour. Could you interpret for me what this means? (1) I work for a very busy convenience store in the Atlanta area. It was busy all morning but at this time it kind of slowed down a bit, when an older black man wearing a baseball hat, flannel shirt, jeans and dirty work boots came up to the counter, seemingly from nowhere. He had a small cup of coffee in his left hand and in his right hand he slapped his money on the counter so hard it startled me a bit but no one else seemed to hear it. He gave me a very serious look while making direct eye contact. He said in a very loud serious voice, “Peace! Always starts from within!! I’ll see you tomorrow! Have a nice day!” And walked out of the store with purpose. Was this man Maitreya or one of the Masters? (2) A couple of Christmases ago, my mom came to visit me and my family. She was down a bit and went on about how people weren’t as polite as they used to be back in the day and how people weren’t even saying hello anymore. Later on we went to the movies. We went to get in the elevator from the parking deck to the theatre. When we were getting on the elevator an older black lady dressed in an all purple outfit came on the elevator. She smiled at all of us but I noticed I was the only one who smiled back. Right then she looks at my mother and said like asking a question, “Hello?” Then my mom and family said hello and smiled. My mom said something like she loved her purple outfit but felt she was too old to wear something that purple. The woman jokingly leaned back as if surprised by the comment. She asked: “Well how old do you think I am?” My mom said 50-something. Right then the lady leaned in very close to my mom as if she was going to hug her. She whispered: “I am so much older than that.” Right then she smiled and gave me a wink. She said she was 77. Then she said to my mom age is all in your head. You are only as old as you feel. She and my mom spoke for a few more seconds. She smiled and wished us all a merry Christmas. Was this woman Maitreya or another Master? On 5 February 2015 at 3pm I was in the Zürich main station. At the meeting point there was a very excellent person in very beautiful clothes. My first thought was: is this a very rich person or a political man? My second thought was: I don’t want to go away from this person he looks very interesting. Was this a Master or maybe Lord Maitreya himself? That day was a special day because I gave Maitreya’s water, Aqua Nordenau, to my mother for the first time. It was night time in winter and was pouring with rain. When I came around the corner there was a man walking towards me. I walked on to the Real Estate window and stopped. Suddenly this man’s voice was asking me if I was looking for a house. I got a real fright as I thought I was on my own. He had crystal clear blue eyes and proceeded to question me on my views about housing and did I have a house. Did I think everyone should have a house? Was this Archangel Michael? I have been wondering who it was since that night. We recently changed the Amsterdam Information Centre into a ‘film studio’ in order to film a panel discussion with an interviewer and three panel members. By means of the question-and-answer exchange between all four speakers we presented the general information about Maitreya and the Masters and Their Emergence and priorities. From the films (we had two cameramen and an audio person) we hope to create short programmes, which we can offer to local and regional TV stations. We also hope to make short TV-ads using the material generated in this way. The audience was invited also to ask questions. Later there were audio recordings of brief ‘vox pop’ interviews with members of the audience. If suitable they’ll also be used for ads in some way. Later, after people had left, some of the group were sitting in the front part of the Centre. We were sitting facing outwards towards the street when we saw a familiar young man. I recognized him from a previous visit he’d made to the Centre in 2013. He didn’t come in but stood just at the front door, taking free literature we have outside the big shop-front window and talking to himself. Then suddenly he looked straight at us and gave a big warm smile. Just before the panel discussion was due to start I had thought of him and regretted not having invited him, since he had given us his phone number when he first visited us. And now there he was beaming at us. Was he a spokesman for the Master Jesus? On 17 January 2015 I was on my way into the Walmart Market store for my Saturday grocery shopping. I noticed a homeless man sitting up against the pillar in front of the grocery store, waving and smiling at the people passing by. He was speaking to each of them, saying “Good Morning” with the biggest smile I have seen on anyone’s face in a long time. Everyone was ignoring him. So as I walked by I said, “Hi, how are you?” and smiled back at him. I went to the restroom and thought I should go back and see if I can get him something to eat. Once again I shook my head and pushed my cart over to the produce section. The nagging feeling, why not go see if he needs some food. I started towards the door and paused, once again shaking off the feeling. I got back to my cart and thought: “This is your chance to do something nice for someone, what will it hurt to ask him if I could get him something to eat.” I marched right outside and looked at him and asked him, “May I get you something to eat?” Once again, he smiled with that huge smile on his face, revealing very few teeth, but still the kindest smile. (Everyone was looking at me like I was crazy to be talking to him.) He said, “No thank you”. A man had just bought him a bar-b-que sandwich and a banana. As he reached into a book bag he pulled out the sandwich and the banana and showed how proud he was to have them. I said, “Let me see how much I have.” At the car wash the attendant had just given me 5 one dollar bills as my change. So I asked him, “Will a couple of dollars be okay?” He said, “Anything you can do is wonderful.” I handed him a couple of dollars and wished him a good day. He said, “God bless you” as I walked back into the store. He was still sitting leaning against that pillar when I left the store. He called out to me once again and smiled and waved goodbye. I said, “Goodbye,” and smiled right back at him. Was he just an ordinary man? Last year my husband and I had a particularly challenging year, having to ‘dig deep’ in every way in order to support vulnerable family members whose security and well-being were at serious risk thanks to the austerity policy of our government. This took a toll on our health and made it difficult to be consistently positive about the work of reaching out to the public with our information about Maitreya. We reached a very low point in October 2014 so I sent out a call for a sign. Then a day or two later, on 28 October, I was gazing sadly out of our window when I saw the most intensely radiant pattern of light on a neighbour’s house. It was stunning as the sunlight was brilliant that morning. It was truly uplifting for us both: just what we needed at that critical time. I have lived in this house for 45 years and have never seen this spectacle here before. Was it a sign, a message of hope for us? On Saturday 3 January 2015 during the Sampson flat bushfires in the state of South Australia, which primarily affected the Adelaide Hills and the outer Adelaide metropolitan area, the face of Jesus appeared on the burning trunk of a gum tree. Local resident Roxanne was fighting the fire that threatened her and her partner Michel’s Cudlee Creek home. Michel is a pilot and was flying a surveillance plane at the time, directing ‘water bombers’ over another bushfire in western Australia. Despite the intense heat and smoke Roxanne managed to take a photograph of the face on the tree. Three weeks later, with the house saved she still thinks the face is amazing, as does everyone else who has seen it. Vibhuti (sacred ash) and amrit (dark honey-like nectar) manifested in a house Edmonton, Canada. Photos taken by T.L. A cross of light appeared on a bathroom window in a building being converted into an osteopathic practice in Nelson, South Island, New Zealand. Taken by osteopath B.C. on 10 April 2015 at 1.30pm. Light formations near Yodoyabashi, Osaka, Japan. Sent by Fumie Murakami in November 2014. Benjamin Creme’s Master confirms that they were created by Maitreya and the Space Brothers. A video showing a bright object, rapidly changing colour and moving, was filmed over Samnanger, Norway, on 14 March 2015 at 7.45pm, by T.W., who sent these still photographs. Scientists have not been able to explain intermittent bursts of radio waves coming from outer space. They follow a mathematical pattern, and have been heard since 2001. Radio waves last just a few milliseconds and erupt with the amount of energy that the sun releases in a month. Ten have been detected so far, most recently in 2014 by a telescope in Australia. But when they flipped the vehicle onto its side they discovered there was no one inside able to speak. “The only people there were the deceased mother and the child,” said officer Bryan Dewitt. “We’re not exactly sure where that voice came from,” said another officer, Jared Warner. Police officers and local firefighters managed to rescue 18-month-old Lily Groesbeck. Her mother had been killed in the crash. We present a selection of quotations on the theme of ‘Joy’ from Maitreya (Messages from Maitreya the Christ), Benjamin Creme’s Master (A Master Speaks), and Benjamin Creme’s writings. Joy (Part 1) was published in Share International December 2007. Then reality will set in again. The problems will still be there. We will still have the pain and suffering of millions starving to death. We will still have the environment to cope with – how to rid the world of global warming and stop the destruction of the planet. The world’s problems will take form again in the minds of millions. Maitreya has not come to start a new religion. He is a teacher, guide and counselor for all humanity regardless of religious affiliation. He will show us how to apply the principle of love in all our relationships whether they are in the economic, political, educational, cultural or social spheres. Many there are who sense that I am here, yet speak not. Why hold this knowledge to yourself when your brothers cry for light, for wisdom, and help? Allow them, too, to share in the joy of the Promise which I bring. People will realize for the first time [on the Day of Declaration] that, up till then, they have only played at life. They have never really touched the core of what life is really about; perhaps as children, yes, but never with that simple, direct, spontaneous experience of what is, what life actually is at this moment, in a way the child automatically, instinctively does. Everything of that full, rich, total absorption in, concentration on, the moment-to-moment experience of life as it is, is covered up by tensions, by ‘busy-nesses’, by all the worries and the problems which surround every adult human being in the world. Few can, for long, experience total enjoyment of the beauty of life, total absorption in that reality. The idea of a ‘circular economy’ or closed-loop system was introduced in 2010 by British yachtswoman Ellen MacArthur. During her circumnavigation voyage in 2004-5, self-sufficiency was essential during her 73-day trip. It made her compare the globe we live on with her trimaran, and she realized that there were parallels. Our planet provides everything necessary for life, yet we continue to ignore the simple fact that resource use is governed by a law of diminishing returns. Also known as ‘cradle-to-cradle’ (C2C), Ellen advocated a non-linear economy, running in loops and reusing materials. In a closed-loop system factories send nothing to landfill and reuse their products at the end of their life. This leads to other benefits such as job creation, resource savings and perpetual waste recycling. In the car manufacturing industry, there is growing recognition that the linear ‘take, make, dispose’ model, which relies on large quantities of easily accessible raw materials and energy, has an unacceptably high ‘carbon foot-print’. So-called ‘efficiency’ is the goal, meaning reduced resources and fossil energy utilized for each unit of manufacturing output. Even so, these non-renewable resources are finite by nature and this can only delay the inevitable. A change of the entire operating system is increasingly being seen as vital. Car companies are starting to adapt elements of the closed-loop system and implement them in their manufacturing process. C2C and Ford have unveiled a ‘Model U’ concept car, with the help of McDonough Braungart Design Chemistry [MBDC] consultants. MBDC advises companies about utilizing C2C principles in their manufacturing systems with the aim of regenerating economy, ecology, and equity. Their new hydrogen-powered vehicle includes polyester upholstery fabric made of a “technical nutrient”. Derived from chemicals chosen for their harmlessness to humans and the environment, the fabric can be recycled indefinitely. The car top is made from a new “biological nutrient”, a corn-based biopolymer that can be composted after use. Hydrogen powered ‘fuel cell vehicles’ (FCVs) have the potential to significantly reduce dependence on oil and lower harmful emissions that contribute to climate change. FCVs run on hydrogen gas rather than oil, without harmful emissions. The cost exceeds that of normal cars, but any investment will reap substantial benefits for human and environmental health. In the UK, the government has promised an £11 million grant for 15 hydrogen filling stations. London is also part of a the HyFIVE project, involving 15 major manufacturers, which aims to put 110 fuel cell cars on the road in 2015 in six major European cities. It will be a rare car for the moment, but the company says it wants to make “tens of thousands in the 2020s”. A conference called ‘This changes everything’ based on Naomi Klein’s ground-breaking book, took place on 28 March 2015 in central London UK and was attended by hundreds of people. A range of speakers included Naomi Klein via a Skype link-up from Germany, and John Broderick, a climate researcher from the Tyndall Centre Manchester who gave some of the most recent information from the Inter-Governmental Panel on Climate Change (IPCC). Historian and author Neil Falkner spoke about the present dysfunctional economic and political global systems as being profit, carbon and war machines all wired up to a capitalist engine which has been producing a steady state capitalism for centuries, taking out more than it is putting in, requiring ever expanding growth, all driven by competition. Many international presenters, including an activist from the Philippines, spoke about the need to build a new inclusive democracy for total system change putting power in the hands of local people and working from the bottom upwards. A Green party candidate and trade unionist proposed that all the various factions represented at the conference join together to produce mass actions. On 7 March 2015, a Time to Act on Climate Change march took place in central London, UK, co-ordinated with several affiliated events around the world. More than 15,000 activists of all ages, ethnicities, religions and nationalities assembled with their friends and families at Lincoln’s Inn Fields and many began by sitting in rows and quietly meditating or praying for a good outcome. The march, organized by the Campaign against Climate Change, ended outside the Palace of Westminster in a rally where people gathered together to hear the speakers. Speakers at the rally emphasized that there is a paradigm shift from just attending marches and demonstrations to committing to planetary, national and local direct peaceful action. Claire Jones, Campaign Co-ordinator, said: “Change doesn’t start with the politicians, it starts with us.” She was echoed by Naomi Klein, Canadian journalist and author, in a video clip: “Here we are, with just nine months ahead of those critical climate talks in Paris. We have nine months to act ourselves. Nine months to become the leaders we need. To lead from below, from the streets, from the neighbourhoods, from the smallest towns to the biggest cities.” She added: “With the anti-fracking movement winning unprecedented victories, the divestment movement spreading around the world and falling oil prices making extreme extraction vastly more costly, there has never been a better time to demand a justice-based transition away from dirty energy. Fossil fuel giants are on the defensive like never before, along with the politicians who have long done their bidding.” Vivienne Westwood, international fashion designer, also speaking by video, proposed that people internationally, take to the streets in their hundreds of thousands and even millions, so great is the threat from climate change. A French activist told the crowd that after the UN Copenhagen Climate talks in 2009, the French seemed disinterested in any action. So she started with a few friends and managed to attract 1,000 people to a rally after many months of campaigning. They persevered and last year, near The Alps in southern France 70,000 motivated people attended from over 50 villages and towns in the area.